Thanks to its Russian legacy, Kazakhstan officially celebrates Orthodox Christmas 7 January, followed by unofficial Old New Year celebration 14 January. This is all to do with the change from the Julian calendar to prevailing western Gregorian calendar in 1918 under the Soviet Rule. As the Julian calendar is slightly off from the Gregorian, Russian Orthodox Christmas and New Year come two weeks late respectively. 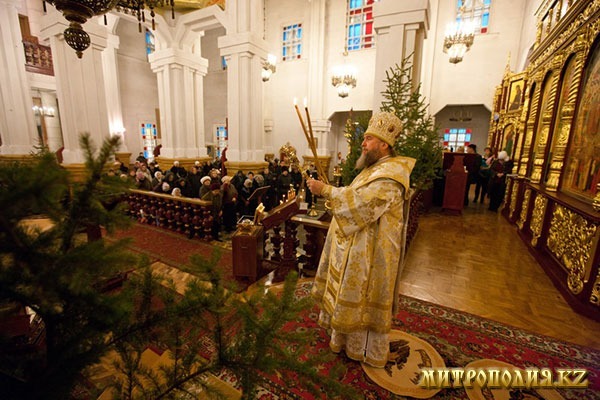 The main celebrations in Almaty take place in the Ascension Cathedral on the Christmas eve, 6 January with midnight liturgy to finish the ceremony. It is fascinating to witness the event. The church bells ringing, people with candles coming in and out the church, choir singing, priests chanting etc. 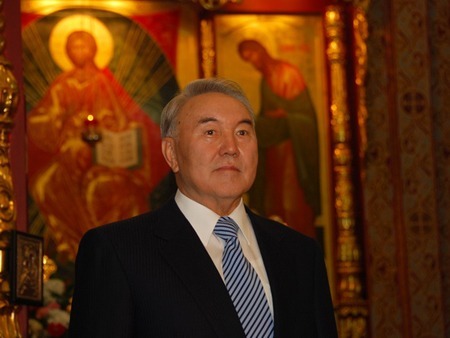 The President of the Republic of Kazakhstan Nursultan Nazarbayev congratulating on Christmas Holiday. Grand Mufti of Kazakhstan congratulating the Metropolitan Bishop of Astana and Kazakhstan on Christmas. The images are property of "mitropolia.kz"